Objective: Learn how to download programs from the MakeCode tool. Overview: Students will create a simple program in Microsoft MakeCode and download it to their micro:bit using a USB cable. 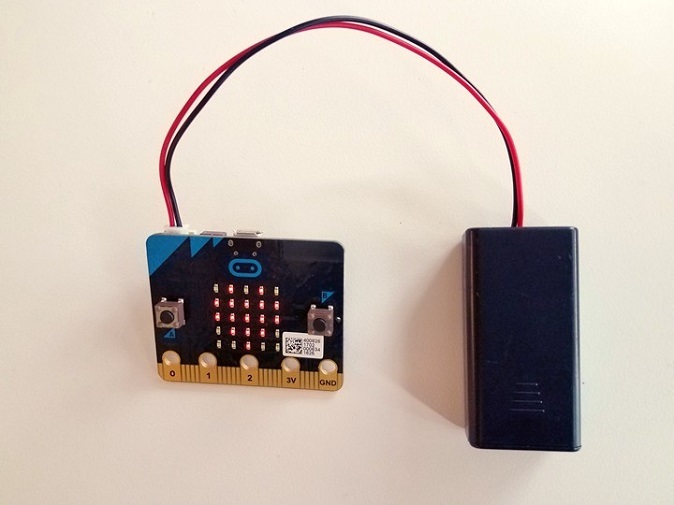 For this activity, students will each need a micro:bit, a micro-USB cable, a computer, and a battery pack. At the bottom of of the editor, name the project as “Happy Sad Face” and click on the disk icon to save the project. Now, click on Home to go back to the home screen. At the right of My Projects on the home screen, click on the Import button and then click on Import File in the import dialog. 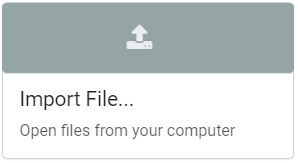 Select the file that you just saved to your computer in the previous step. The color of the blocks identifies their category. All of the blocks that make up the program above come from the Basic Toolbox category, which is light blue. To download the file to your micro:bit, you must connect it to your computer’s USB port using a micro-USB cable. 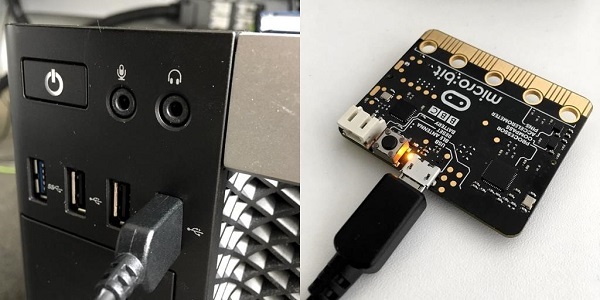 The micro:bit will draw power from your computer through the USB connection, or you can connect an optional battery pack so it can function even after it is unplugged from the computer. Once plugged in, the micro:bit shows up on your computer like a USB flash drive. Click the purple Download button in the lower left of the MakeCode screen. This will download the file to your computer, to the location where your browser is set to save downloads. To move the program to your micro:bit, drag the downloaded “microbit-xxxx.hex” file to the MICROBIT drive, as if you were copying a file to a flash drive. The program will copy over, and it will begin running on the micro:bit immediately. 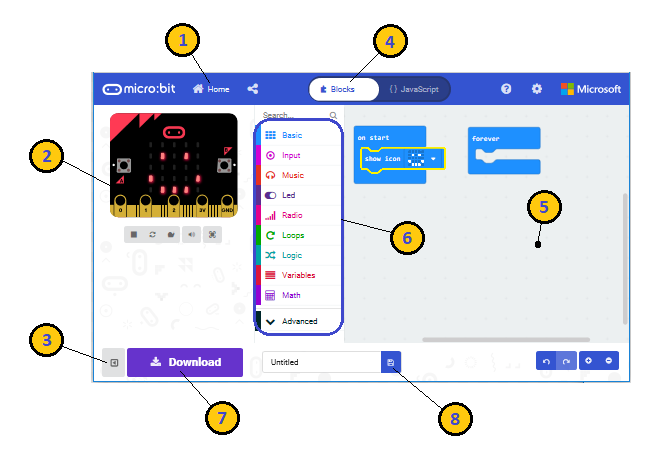 The micro:bit will hold one program at a time. It is not necessary to delete files off the micro:bit before you copy another onto the micro:bit; a new file will just replace the old one. 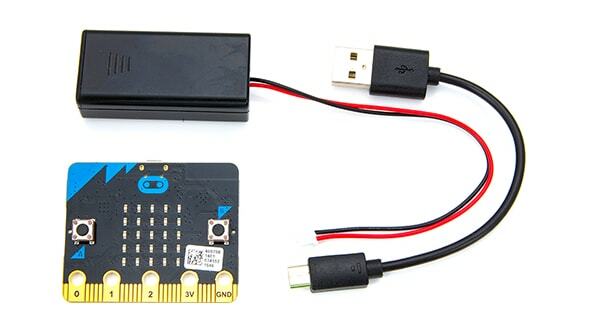 For the next project, your students should attach the battery pack (it takes 2 AAA batteries) to the micro:bit using the white connector. That way they can build it into their design without having to connect it to the computer.